Baseball season has opened. Spring has started, but not yet sprung. Then there are still some prominent New Hampshire high school hockey players still playing hockey. They are playing at National Championships in places like East Lansing and Lansing, Michigan, as well as Dallas and Plano, Texas. They are playing against competition from all over the country. As you may, or may not, know, I have a passion for covering hockey here. Especially, Goffstown High School hockey, but also much about hockey in New Hampshire. So, these National Championships are full of high school players from around the country, including NH. Goffstown High School is represented by Nick Nault and Noah Charron on the NH Avalanche 18U team, and Griffin Cook on the Manchester Flames 16U team. 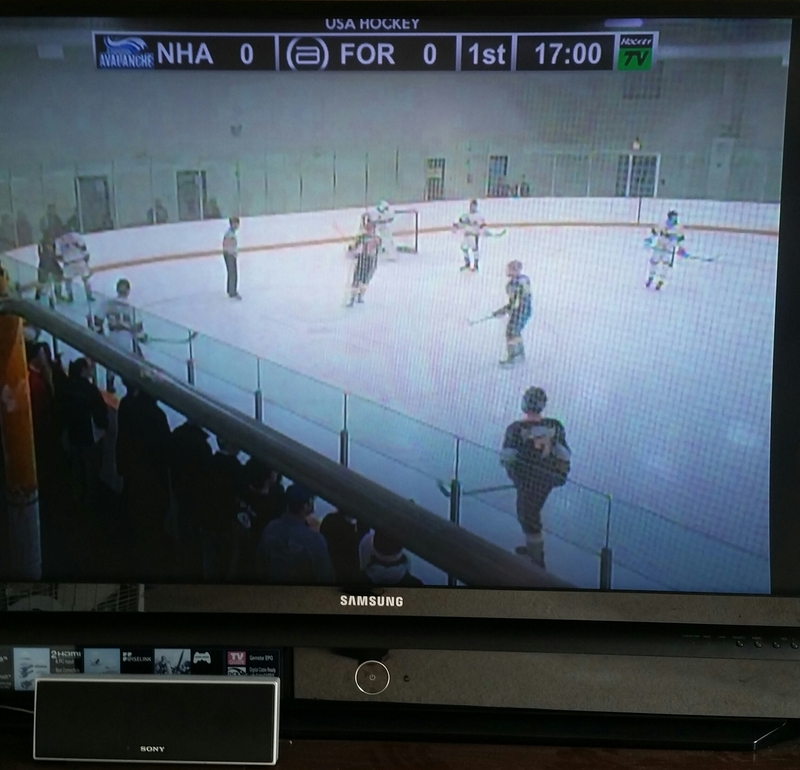 Disclaimer: Okay, HockeyTV has not yet embraced the idea of offering/sharing clips and highlights for free, as a selling point to get more subscriptions to watch live games. So, it would cost some money to watch games, highlights, clips, etc. Believe it or not, you can watch these games online. Register with HockeyTV, subscribe (it does cost something), and you will have access to any games you want, in any of the sites. My profile on HockeyTV is 1inawesomewonder. You can follow me on the site if you subscribe, and I have compiled video clips, or highlights of the goals scored by the NH Avalanche 18u team and by the Manchester Flames 16u teams during game play on Thursday, April 6th and Friday, April 7th. I could post the links to each video, but you cannot see them without a subscription. If you have a subscription with HockeyTV, then you can follow me, and see the clips to all of the goals. The NH Avalanche 18U team is playing in Michigan. The Manchester Flames 16U team is playing in Texas. 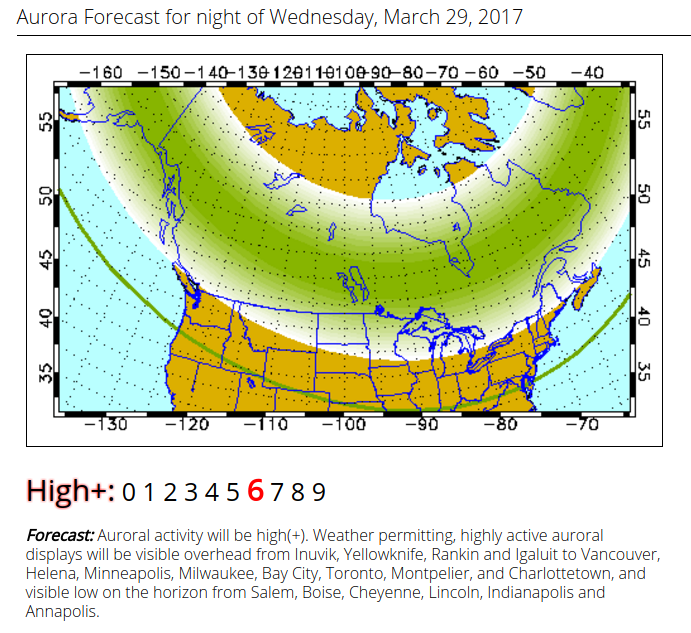 The Northern Lights forecast that I check periodically. Sometimes, God sees fit to place us, from birth, in the care of a mother who will spend the rest of her days mastering the skill of motherhood. These mothers, they never stop learning, all the while, they teach and perpetually apply a lifetime of lessons. Then, as life meanders speedily along, and it takes us wherever we may roam, these mothers, they are somehow always right where we need them to be. They are steady. They are strong. They are safe. They are immense, while remaining the softest place to land. They are bold. They are patient. They bite their tongues long enough for us to learn our own way. They have our backs just because we ask them to. They hurt for us more than we do. They worry for us more than we do. And as we travel through the ups and downs, they are always there for us, they are our fortress. HOOKSETT — Vivian C. (Lapointe) Kotowski, 83, of Hooksett, died March 30, 2017 at Maple Leaf Health-Care Center in Manchester after a brief illness. She was born in Manchester on February 27, 1934 to Arthur and Gilberte (Cote) Lapointe. She lived in Manchester for many years before moving to Hooksett in 1977. Vivian worked at a number of places over the years, most recently at Hannaford Supermarket in Hooksett. She was a member of the Kiwanis Club of Hooksett and the NH Chapter of the Association of Retirees of Eversource and Northeast Utilities (ARENU). The family includes her husband of 59 years, Frank R. Kotowski of Hooksett; three children, Lori Uliasz and her husband, Gregory, of Bedford, James Kotowski and his wife, Vicki Montgomery, of Floyds Knobs, IN and Susan Beal of Manchester; seven grandchildren who were her world, Meghan Uliasz and her fiancé, Tom Stackhouse, Greg Uliasz, Zack Uliasz, Stephen, Ryan and Erin Beal and Lydia Kotowski; a sister Gertrude Burke of Manchester; and nieces and nephews. SERVICES: There are no calling hours. A Mass of Christian Burial will be celebrated Monday at 10 a.m. at Holy Rosary Church, 21 Main St., Hooksett. Committal prayers will follow in the chapel of the NH State Veterans Cemetery, 110 Daniel Webster Highway, Boscawen. In lieu of flowers, memorial donations may be made to Hooksett Kiwanis Kids Closet, c/o Hooksett Kiwanis Foundation, P.O. Box 16443, Hooksett, NH 03106. Lambert Funeral Home & Crematory, Manchester is assisting the family with arrangements. To leave a message of condolence, visit www. lambertfuneralhome.com.